O'Reilly On The Falklands War: "I've Seen Combat Up Close And Personal"
Bill O'Reilly claims he never said he was in the Falkland Islands while reporting on the Falklands War from Buenos Aires. But over the years, O'Reilly has repeatedly created the impression he was in a combat zone. KEVIN (CALLER): Hey, yeah, I have to say real quick, I've been -- I've listened to interviews from the guy that was saved and from some of the other Swift Boat, the guys in these new groups that have come on talking about it. KEVIN: -- so they're always trying to say well, no -- well, you weren't on Kerry's you -- you -- his Swift boat. You didn't have to be. You were 20 feet away on another one. 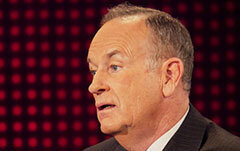 O'REILLY: -- from personal experience. O'REILLY: I -- I was in a combat situation in Argentina during the Falklands War, OK? O'REILLY: And I can tell you when the Kool-Aid hits the fan, OK, nobody is locking in on anybody else. Nobody. O'REILLY: -- adrenaline -- adrenaline surges and you veterans out there listening right now, you know exactly what I'm talking about here. Adrenaline surges, your senses become very attune, much sharper than they are ordinarily, and you are locked in, focused in, on your survival and achieving the means of staying alive. You're not watching what happens in the boat next to year. You're not watching any of that. OK? You are -- you are zeroed in on your situation. And that's why I am believing the guys that are sitting next to this Kerry, because the guys away from him, yeah, maybe somebody looked over, and yeah, but what probably happened was after the fact people talked. And that's what always happens. And then perceptions are shaped. But they're always ab -- they're never primary source perceptions. O'REILLY: You know, sometimes you have to boil it down to just that. He checked the box. Will you go into combat? He checked the box. You got to -- you got to respect that. I don't care who it is. Even if it were one of the smear merchants, even if it were Michael Moore. If Michael Moore had checked the box -- yes, I will go into combat -- I would respect that. But, of course, Michael Moore did not check the box. O'Reilly Suggests He Was "In A War Zone" In "Argentina During The Falklands War." On the November 17, 2004 edition of his radio show, O'Reilly used his experience to speak as an authority on "combat situation[s]." O'Reilly argued that "When you're in a combat situation you're wired, which means that you're not in a normal state. Your adrenaline is flowing, your senses are acute." He went on to say in his experience "in a combat situation," he "had to make a split decision in Argentina during the Falklands War," and "had to make a split decision on what to do when a guy had an M-16 pointed at my head from 10 yards away." O'REILLY: And let me just tell you how this went down 'cause I've been in a combat situation. When you're in a combat situation you're wired, which means that you're not in a normal state. Your adrenaline is flowing, your senses are acute--you are, and this is everybody. If you've ever been in a life/death situation, and I've been in one 3 or 4 times, where I almost got killed. So, your whole body and your whole disposition changes. Because your senses are so heightened. This guy's the point man. He walks into a small room in a mosque where there are a buncha people on the ground. Okay? He doesn't know who those people are or what state they're in. The day before, one of his guys in his squad gets killed because he tries to remove a body that's bobby-trapped. So, the guy's in there, he's the point guy. He walks in the room and he sees sudden movement from this guy on the ground and he yells out to warn his other guys. And, then he shoots the guy--because he's not going to wait to see if the guy's got a grenade--which he absolutely could have. Or, a pistol or whatever the guy--a bomb. He's not going to wait, nobody would wait. You don't wait. This guy is in a war zone. He's illegal, he's in a mosque--shouldn't have been there in the first place. He's trying to kill you. Bang, he's dead. That's what happened. So, you're not--it's not like you're walking down the street in a rational state of mind and you're making decisions based upon data. It doesn't happen in a war zone. I had to make a split decision in Argentina during the Falklands War. I had to make a split decision on what to do when a guy had an M-16 pointed at my head from 10 yards away.